Ganz urges people to carefully look at their pocket change because some of the state quarters can be worth between $100 and more than $1,000 each because of minting mistakes. “For example, some of the Wisconsin state quarters made in 2004 have an extra leaf on the cornstalk on the tail’s side, and those are selling for over $100 each now. Other state quarters, mistakenly struck on the wrong metal blanks, have sold for $1,000 or more. It will be interesting to see what potentially valuable mistakes and varieties people may find with the Hawaii quarter when it goes into circulation,” said Ganz, a New York City attorney and former President of the American Numismatic Association. Former United States Mint Director Philip Diehl has said Ganz deserves “the lion’s share of the credit for making the 50 State Quarters Program a reality.” The program has helped reduce the federal budget deficit by billions of dollars the past decade. “Because it costs the mint only about seven cents each to make quarter-dollars but they are ‘sold’ to the Federal Reserve Bank for 25 cents, the difference in profit over ten years is more $3.5 billion. It’s an accounting technique called seignorage, and the money is used to pay down the national debt,” Ganz explained. 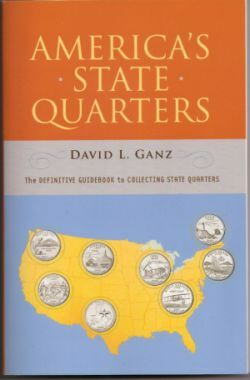 America’s State Quarters is a guidebook to collecting the state quarter-dollars that were issued from 1999 to 2008, honoring each of the 50 states, and a look ahead to commemorative quarters that will be issued next year for Washington, DC and five U.S. territories. It provides collecting tips and how to identify valuable mint-made errors. The book also gives readers interesting background information about the history of the surprisingly difficult and politically sensitive undertaking to launch what became an overwhelmingly successful program that prompted 147 million Americans to collect the coins, according to mint estimates. The book is available at Random House, Amazon and many bookstores.